The Philippines is a string of islands that is home to 95 million people, located near Taiwan, Vietnam, and Indonesia. Travelers find themselves surrounded by breathtaking ocean and bright green landscape as soon as they step off the plane. The country is filled with national parks that are filled with amazing caves and intricate rock formations. With over 7,000 islands, the Philippines boast white sand beaches, coral reefs, and beautiful mountains. Performing arts flourish throughout the region and help give this island nation its rich culture. Music is an integral part of the lives of most residents, from gong music to the lyrical Harana and Kundiman to Filipino pop songs (called Original Pinoy Music or OPM). Choral music is also very prevalent in the Philippines and traditional ethnic music has become more popular in recent years. On Friday, November 8th, 2013 Super Typhoon Haiyan tore through the Philippines and caused devastating damage, especially in Tacloban City where Performing Arts Abroad has projects and support staff. The area was completely destroyed and most people lost their homes and their livelihoods. Over 6,000 people were killed. Performing Arts Abroad was able to join many other organizations around the world in supporting the rebuilding effort, and we are thrilled to announce that programming for music and dance volunteering has been re-launched. We believe the performing arts are more important than ever for providing young people a creative outlet, a way to deal with the trauma they experienced, and a positive activity to pursue in the midst of rebuilding their lives from nothing. Empower Filipino youth and help inspire self-confidence by teaching them dance skills and giving them a venue for artistic expression. 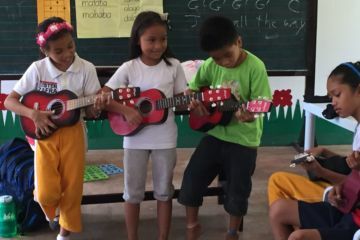 In an area where most musical instruments were completely destroyed by a devastating typhoon, your contribution as a guest music teacher will make all the difference.